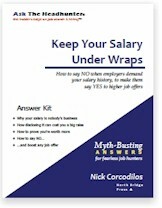 "I love Nick's new Keep Your Salary Under Wraps. It worked for me. Despite the headhunter and the company insisting I disclose what I was getting paid at my old job, I stuck to my guns and I was able to DOUBLE my salary. That would have never happened in a million years if I had caved!" 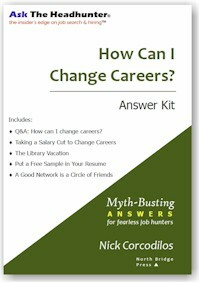 Nick Corcodilos taught a series of lessons based on How Can I Change Careers? "The hiring manager more or less offered me the position on the spot and indicated a salary range that is roughly 40-50% more than I make now. Your two biggest lessons (at least for me) at work in the flesh: Never divulge my current salary, and Talk about what I will do, not what I've done. They oughta make you a Cornell professor! I can already see that the one hour you spent with us will have as much impact on my MBA ROI as any class that I have taken in the program, if not more so." Buy both books & SAVE $3.00! PLUS get a BONUS mp3 for FREE! Price for bundle - buy both PDF books! Format: PDF, 8.5X11. These are e-books.